„ Acting is the crown on all kinds of art; it is a beautiful profession. Be proud of the fact that you are an actor. ” These are the words of Hungarian poet and actor Sándor Petőfi. I believe Basil Rathbone was a proud man, but at the same time had the profession that tops all arts. He played with grandiose submissiveness. For me he was The Actor since my childhood – and he will remain till the end of my life. When I was a kid, I thought all the figures I see on tv are real: dwarves, kings, magicians and witches. This was the time when I saw Erroll Flynn’s Robin Hood. There was an evil character in the movie, who had great punch lines and was very engaging for me. He was Sir Guy of Gisbourne, with manly attitude, an excellent fencer with reflexes as quick as lightning. I got to know later that the people I see onscreen are actors who only play the different characters. 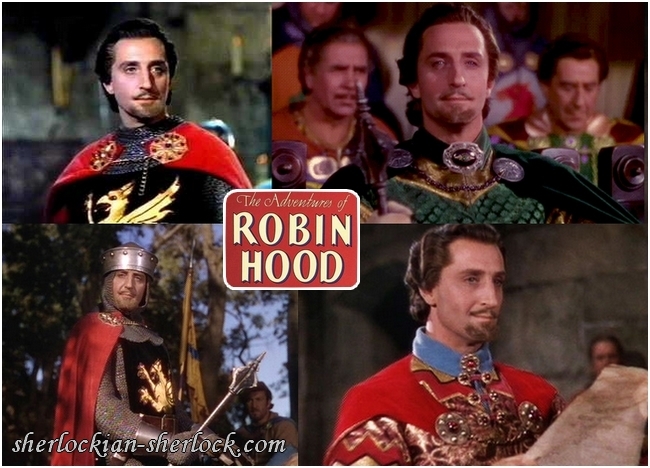 It soon came into my mind that someone played the evil character who fenced with Robin Hood, wearing red-and-blue clothes. Unfortunately I have never seen the movie again. Time passed quickly. I watched lots of movies and got to like several fantastic actors, but none of them had such an effect on me as the man who portrayed Guy of Gisbourne. Not just his acting was incredible, but his elegant look and features reminded me of my dear grandfather. I like him very much, even if his name is unfamiliar for most of the people in my beloved country or they do not remember the old movies in which he starred. It does not matter that my taste is not modern, my mind and my heart exactly knows that the world will never forget this English gentleman. I already heard about Sherlock Holmes when I was a teenager, but I really begun to like the character as a grown woman. Obviously every Holmes fan understands how deeply Jeremy Brett’s brilliant detective touched me. I read what an enormous challenge it was for him to play the legendary hero of Conan Doyle after such a stunning actor like Basil Rathbone, whom the whole world respected as Sherlock Holmes and England was extremely proud of him. After reading a lot about Jeremy’s predecessor, I searched for him on the internet and I could hardly believe my eyes. I owe Sherlock Holmes to find the man for me who was Guy of Gisbourne and whom I had never forgotten. It made me proud that Basil Rathbone too played the king of detectives and I was absolutely sure that he was unforgettable in the role. Sherlockian websites describe the Holmes portrayal of my favourite actor as stunning by right. I regret one thing very much: that Basil did not have such an exceptional Mycroft like the one played by Mark Gatiss in BBC Sherlock. Of course I know that Sherlock’s brother is mostly a supporting character and Conan Doyle himself did not want him to be too meaningful. Mark Gatiss was a young boy when Basil donned the deerstalker. He admits Rathbone’s protrayal had an enormous effect on him, and I think much of that can be observed in his thrilling Mycroft. That is why I would be glad to see them in a movie together… Though Mr. Gatiss is not the only person who got inspiration from the wonderful Basil Rathbone. He was the model of Disney’s Basil of Baker Street (who is a mouse and Rathbone gave him his voice). The Sherlock Holmes silhouette was often shaped to resemble him, and the character of Sherlock Hemlock was also based on the brilliant actor. Basil received several awards and had three stars in Hollywood’s Walk of Fame. He was rewarded rightly, because he could shine in minor roles as well. Stanislavsky could have written about him: „ Remember: there are no small parts, only small actors. (…) Today you are Hamlet, tomorrow you’ll be a walk-on, but you are always an artist. ” Basil was never suppressed by his roles, because he was a real artist, who played every role with stylish perfectionism. Everything manifested in him what made British acting acclaimed around the whole world: exactitude, creativity, talent and devotion. To portray Sherlock even better, Basil learned to play the violin and he sat for hours while the makeup artists made a mask for the disguise of Holmes. He played the detective in theatre, in radio plays and in advertisements. He knew that his name is united with the role so he cordially took on the sleuth every time his fans asked for it. He always talked affectionately about the London investigator, though Romeo was his favourite role, what he played onstage. 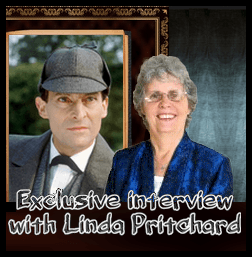 He respected Holmes and portrayed him miraculously – that is why Sherlock fans never piqued at him. They had no reason for that. 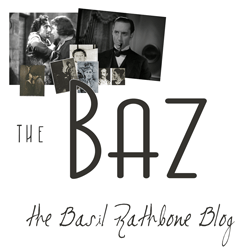 Just like Sherlock Holmes, Basil Rathbone was a real gentleman, who always dared to stick to his opinion. In addition, he took over the lead with his ideas and took responsibility for his deeds. In the first World War he convinced his superiors that a raid is important – he received Military Cross for his valour. Author: SherlockExtra Translator: Revati - © All rights reserved.